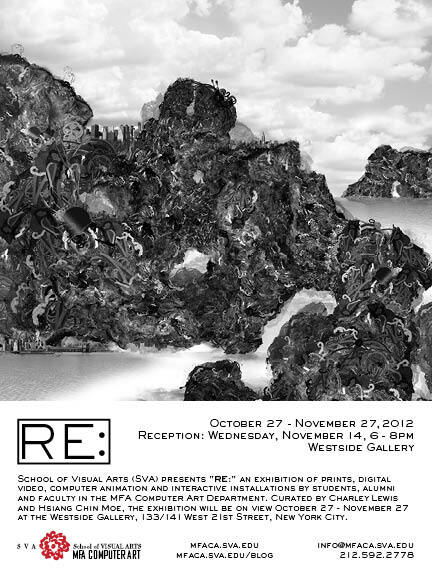 SVA presents “RE:,” an exhibition of prints, video, computer animation and interactive installations by MFA Computer Art Department students, alumni and faculty. Curated by Charley Lewis and Hsiang Chin Moe, the exhibition is on view through November 27 at the Westside Gallery, 133/141 West 21st Street in Manhattan. Exhibiting alumni include Rachel Fujita (MFA 2007 Computer Art), Dustin Grella (MFA 2009 Computer Art), Valerie Hallier (MFA 1994 Computer Art), Hwayong Jung (MFA 2011 Computer Art), Hyung Gyu Kim (MFA 2012 Computer Art) and Charley Lewis (MFA 2012 Computer Art). Grella is an animator and documentary filmmaker whose work finds drama in the seemingly mundane. His work has been screened at the Cannes Film Festival, Margaret Mead Film Festival, and the Ottawa International Animation Festival, where it earned the Walt Disney Award. His film Prayers for Peace has been screened at over 150 festivals worldwide, winning over 40 awards. The Westside Gallery, located at 133/141 West 21st Street in Manhattan, is open Monday through Friday, 9am to 7pm; Saturday, 10am to 6pm; closed on Sundays and public holidays. The gallery is wheelchair accessible. For more information, please call 212.592.2145. The MFA Computer Art Department emphasizes creative experimentation and a multidisciplinary approach to making art with computers and emerging technologies. Dedicated to producing digital artists of the highest caliber, the department guides each student in the development of a personal artistic style in a course of study that is individually tailored to meet his or her needs. Students come from around the world to study in this MFA program, which has distinguished itself with six Student Academy Awards and four Regional Finalists in 2012. For more information, visit mfaca.sva.edu. Next Next post: A Winter day on Coney Island.